22:30 With that gold comes the last of our sporting action here in Nanjing. Hey, hey, no need to cry. We'll be back tomorrow evening at 18:00 sharp to bring you a much anticipated Closing Ceremony. We've been promised a homage to selfies during the event, as Nick Butler reports in his article on the ceremony, so be sure to tune in and catch all the news,gossip and highlights of that. 22:20 And there is the final whistle, not only rounding off the football, but also the whole sporting programme for the Nanjing 2014 Summer Youth Olympic Games. 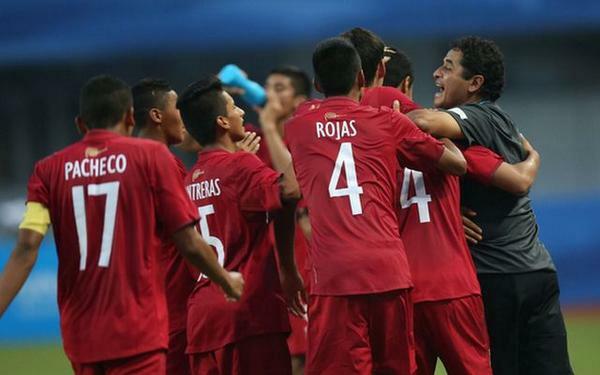 It's Peru who claim the final gold of the Games as they hold on to their 2-1 lead over South Korea. A great win for the boys in red! South Korea will be disappointed to come away with silver but they gave it their all in that final. Bronze goes to Iceland following their 4-0 thrashing of Cape Verde in the playoff match. 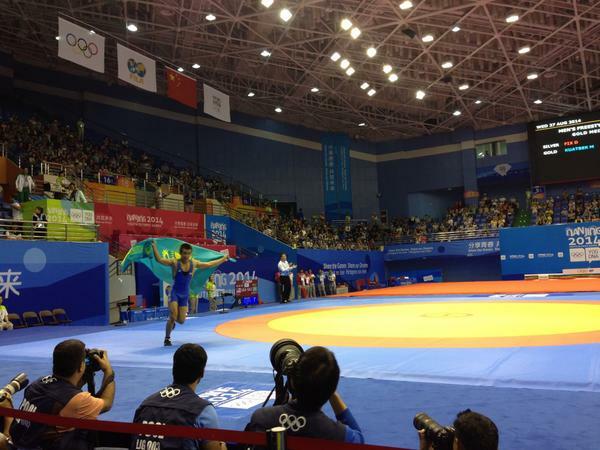 21:47 There is just one match left of Nanjing 2014 and it's an exciting one! Peru were 1-0 down in the first half of their men's football gold medal final with South Korea but have now turned the encounter on it's head. Goals from Franklin Gil just after the break and Fernando Pacheco on the 56 minute mark have given them a 2-1 lead coming into the final 25 minutes of this final. 21:30 The Russian pairing of Oleg Stoyanovskiy and Artem Iarzutkin have been unbeatable at these Youth Olympic Games. None more so than in their gold medal final with Venezuela's Rolando Hernandez and Jose Gregorio Gomez where they have just run out straight set victors to seal the gold! The duo raced to a 21-12 opener before sealing the deal in similar fashion in the second by securing a 21-13 victory! That leaves the Venezuelans to settle for silver while Leandro Nicolas Aveiro and Santiago Karima Ulisi of Argentina took the bronze. 21:15 It's all over in the hockey and Australia have taken the win. In a nervy final there was only ever going to be one way to call it - penalties.. The first for attempts were put away safely, however, a miss from Canada in the third left the door open for Corey Weyer to step up and slot home the winner. 3-2 to Australia in the shootout and gold for the team in green and gold! Spain claim the bronze after their emphatic victory over South Africa in the bronze medal playoff. 21:10 There's also action in the other two sports to speak of! The Russian pairing have stormed into a one set lead in the beach volleyball as they secured the opener 21-12. They look in control of this one and it'll take a real effort for the Venezuelan duo to pull it back!! 21:01 It's hotting up now in the hockey! Australia looked home and dry, sitting 3-1 up in the final period, however, the Canadians hit back with two quick fire goals within the last five minutes to send this to a shootout! Great stuff! 20:45 If they were in high spirit before, they certainly will be now. 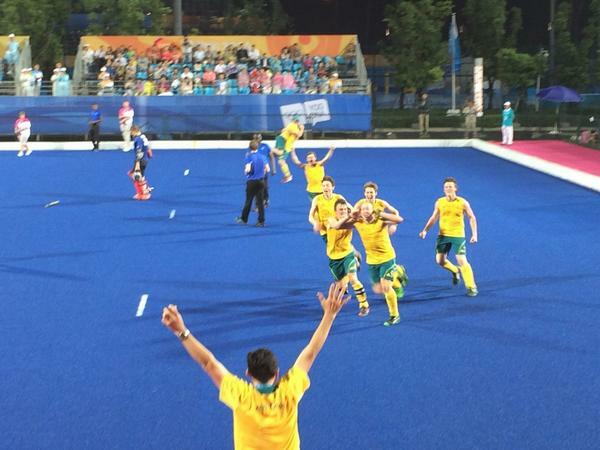 Australia take the lead in the men's hockey5s final. The teams are coming in for their first break now. Still a long way to go and still a lot of scoring left to be done, I feel. 20:35 Just three sports left of the Nanjing 2014 Youth Olympic Games now! Wow! All of them are team sports and all of them are into the gold medal final! We've got the men's beach volleyball final between Venezuela's Rolando Hernandez and Jose Gregorio Gomez and Oleg Stoyanovskiy and Artem Iarzutkin of Russia, the football between Peru and South Korea and last but certainly not least, the hockey5s between Australia and Canada. 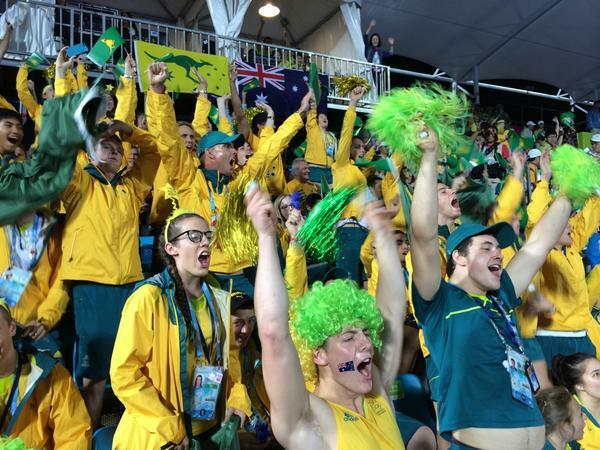 It looks as though the Aussie fans are in high spirits down at the hockey, as well. 20:23 And the final wrestling gold of Games goes to Azerbaijan! Igbal Hajizada is the man to seal it as he overcomes a tough encounter with Moldova's Dmitri Ceacusta. That's a second gold of the night for Azerbaijan at the Longjiang Gymnasium. Bronze is won by Egypt's Abdalla Elgizawee. 20:10 Russia have sealed a commanding win in the rhythmic gymnastics group all-around final as they top the scoring in both the hoops and clubs to take home gold. A 14.700 in the first rotation followed by 14.850 in the second gave the five Russian girls a comfortable two and a half point lead over their closest rivals, Bulgaria. Despite the gap at the top, Bulgaria put on a great show to sit two points clear of third and secure a well deserved silver in this competition. Rounding off the podium was the team from Kazakhstan as they came out on top off a tough battle for the final podium position. 19:57 Spain have taken bronze in the men's hockey5s with a 7-4 victory over South Africa. The Spaniard's opened up a 2-0 lead in the first period and held off a fierce fight back in the second to stay two up going into the final 10 minutes of the match. Here they asserted their dominance again and kept a comfortable barrier between themselves and a strong South African contingent. 19:43 Yajuro Yamasaki has secured gold for Japan in the wrestling with a comfortable defeat of Georgian wrestler Meki Simonia. The 76kg competitor opened up a lead in the first period before dominating the second to ensure the win. Bronze goes to Armenia's Sargis Hovsepyan. 19:29 Teymur Mammadov has won gold in the wrestling! 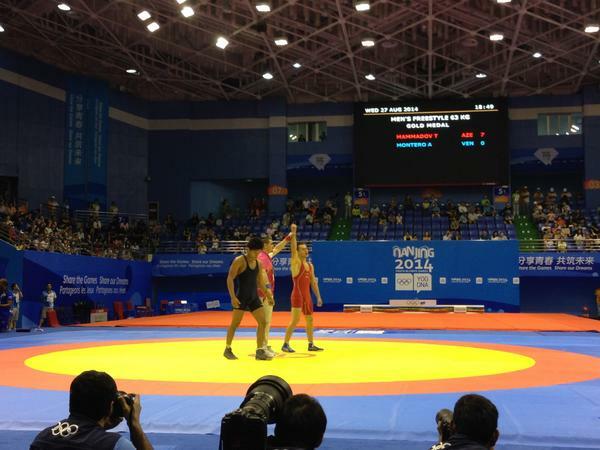 The Azerbaijani gets the better of Venezeula's Anthony Montero to seal the 63kg freestyle title. He was favourite coming into the competition and duly delivered here in Nanjing. Bronze goes to Georgia's Iveriko Jilakidze. 19:10 The rhythmic gymnastics all-around final is getting underway at the Olympic Sports Centre Gymnasium now with Russia, Bulgaria, Uzbekistan and Kazakhstan all gunning for gold. The competition sees five gymnasts in each team take to the equipment at the same time - hoops and clubs - as they perform a routine to the onlooking judges. 18:54 Another gold and another defeat for the Unites States I'm afraid, as Kazakhstan's Mukhambet Kuatbek takes down Daton Fix. The Kazakh wrestler was on top form in this 54kg final as he recorded yet another 3-1 victory. Armenia's Vaghinak Matevosyan bounced back from defeat to the the eventual gold medallist to secure the bronze. 18:45 There's been a first gold of the evening in the wrestling as Ismail Gadzhiev of Russia defeats America's Cade Olivas in the 46kg freestyle contest. The Russian seals the deal with a 3-1 victory over the American as the finals begin to roll out at the Longjiang Gymnasium. Bronze is secured by Turkey's Cabbar Duyum. 18:40 Talking of bronze medal matches, one is happening right now at the JSC Stadium where Iceland are leading Cape Verde 3-0 in the men's football. Iceland led 2-0 at the break courtesy of a Kolbeinn Birgir Finnsson penalty and Torfi Timoteus Gunnarsson. This lead was extended just two minutes into the second period following an own goal by midfielder Fabio Filipe Ramos de Brito. 18:30 After trailing 1-0 after the first period, Pakistan fought back to defeat New Zealand 4-3 in the men's 5-6 placed hockey5s playoff. The boy's levelled the tie during a thrilling second period, before snatching a single goal in the third to seal the win. 18:14 An update from the diving where the Norwegian/Mexican duo of Daniel Jensen and Alejandra Orozco Loza have taken gold in the mixed international team event. The duo recorded a total score of 379.50 over the six dives to fend off competition from China's Shengping Wu and partner Mohab Elkordy of Egypt. In third came America's Gracia Leydon Mahoney and Ukrainian Pylyp Tkachenko. 18:01 And the final gold medal of the boxing goes to Germany! In a battle of the big guns, Germany's Peter Kadiru gets the better of American counterpart Daramni Rock to become the super heavyweight champion. Marat Kerimkhanov will fill the final spot on the podium after taking bronze yesterday. 17:48 In the men's hockey5s New Zealand are currently a goal up on Pakistan in the 5-6 place classification match. 17:39 Another boxing gold at the International Expo Centre with Cuba's Yordan Alain Hernandez Morejon the latest victor. The Cuban beat Croatia's Toni Filipi in a split points decision by the judges in the penultimate boxing final of the Games. 17:26 Golden success for Blagoy Naydenov in the boxing as the Bulgarian defeats Kazakhstan's Kazakov Vadim in the light heavyweight competition. The Bulgarian looked strong in the opening two rounds and, despite the Kazakh boxer getting the better of the third, hung on to seal the gold. Armenian Narek Manasyan was the winner of the bronze medal in his bout yesterday. 17:19 Mexico have ended the men's hockey5s competition in eighth after a 7-4 defeat at the hands of Zambia. The Zambian ended the first period 2-1 ahead and went on to extend this lead to 5-2 come the end of the second. Mexico dug deep in the third to pull back two goals but this was equalled by the African nation who should be satisfied with a solid showing at these Games. 17:10 Another French gold in the fourth and final slalom event! This one is picked up by Camille Prigent in the women's K1 obstacle final following an agonisingly close encounter with China's Jiahua Yan. The French competitor finished in 1:20.211, around 0.600 seconds ahead of Yan. 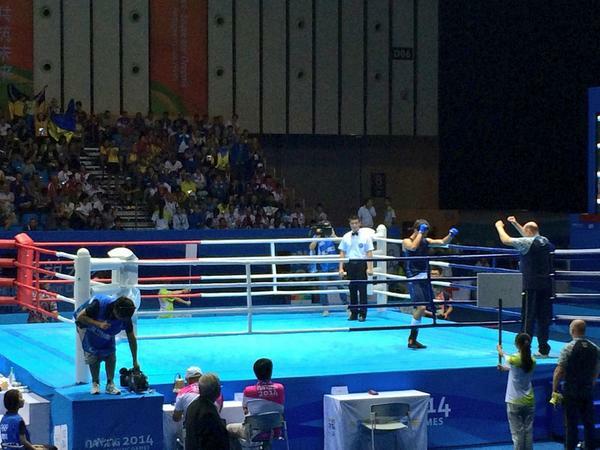 17:00 Ukraine have taken gold in the boxing courtesy of Ramil Gadzhyiev! The 16-year-old beats Russia's Dmitrii Nesterov to the punch in the men's middleweight category to seal gold here in Nanjing. Bronze is picked up by Croatia's Luka Plantic. 16:56 Lucas Roisin of France has just edged Ireland's Robert Henderick in the gold medal final of the men's C1 obstacle slalom competition. The Frenchman recorded a time of 1:18.179 to finish less than a second quicker the the Irishman. That's the closest finish we've had so far in this event. Bronze is won by Slovakia's Marko Mirgorodsky after another Slovakia/Slovenia showdown in the bronze medal playoff. 16:52 Venezuela's Rolando Hernandez and Jose Gregorio Gomez have booked their spot in the final of the men's beach volleyball after securing a straight sets 21-18, 21-19, victory over Argentina's Leandro Nicolas Aveiro and Santiago Karima Ulisi. They will now face the daunting Russian pairing of Oleg Stoyanovskiy and Artem Iarzutkin. 16:45 Slovenian gold on the water as Anze Urankar takes the win in the men's K1 obstacle slalom final. The Slovenian was slower than his opponent, Slovakia's Jakub Grigar, in the semi-finals but put in the performance when it counted, recording a time of 1:09.057 for the win. 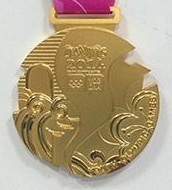 Bronze was picked up by China's Song Huang following a victory against Great Britain's Paul Sunderland. 16:40 Alejandra Orozco Loza of Mexico and Daniel Jensen of Norway have taken the lead in the diving after the second set of dives. The pair sit on 227.50 points, 3.35 ahead of China's Shengping Wu and Mohab Elkordy of Egypt. 16:33 Austria's Nadine Weratschnig takes the first gold over at the Xuanwu Lake Rowing-Canoeing Venue with victory in the women's C1 obstacle contest. The Austrian was untouchable in the semis and proved so again here, beating Czech Republic's Martina Satkova with a time of 1:25.659. The bronze medal match had been held slightly before the final and saw Germany's Birgit Ohmayer claim the bottom step of the podium. 16:23 Bektemir Melikuziev of Uzbekistan has taken gold in the welterweight boxing division. He beats Juan Solano of Dominican Republic with a unanimous decision by the judges. Bronze goes to Italy's Vincenzo Lizzi. 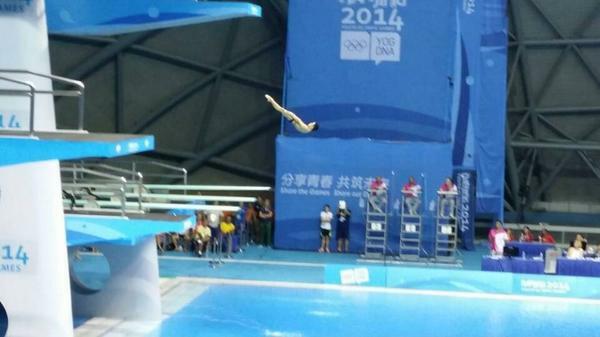 16:15 We're underway in the mixed international team diving competition over at the Olympic Sports Centre Natatorium. This competition sees two divers - one male, one female - from different nations paired together via a draw. The two divers must complete three dives each with at least one of the dives from each board - the springboard and the platform. Two of the dives are limited to a 2.0 difficulty with one of these completed by each of the team members. The other four dives have unlimited difficulty. Leading after the first set of dives we have Philippe Gagne of Canada and Josefin Schneider of Germany. 16:07 The first hockey5s match is up and running at the Nanjing Youth Olympic Sports Park with Zambia and Mexico battling it out in the men's seventh and eighth place playoff. Players have just come in after the first period with the Zambians leading by two goals to one. 16:02 There's been a walkover in the boxing as Vincenzo Arecchia of Italy is gifted the gold in the light welterweight division. He was meant to be fighting Japan's Toshihiro Suzuki, however the Japanese boxer appears not have been able to fight. We'll find more details on that soon. Bronze goes to Adem Furkan Avci of Turkey. 15:57 Oleg Stoyanovskiy and Artem Iarzutkin of Russia have booked a place in this evening's men's beach volleyball final after a straight sets victory over Finland's Santeri Siren and Miro Maattenen. The Russian's took the opener 21-11 before making even quicker work of the second, winning it 21-10. They now face the winner of the clash between Argentinian duo of Leandro Nicolas Aveiro and Santiago Karima Ulisi and Venezuela's Rolando Hernandez and Jose Gregorio Gomez. 15:46 Semi-final action has come to a close in the kayak-canoeing slalom events as we move into the bronze medal playoffs and then the all-important the gold medal finals. The men's C1 final will be contested by France's Lucas Roisin and Ireland's Robert Henderick. Roisin booked his place through victory over Slovakia's Marko Mirgorodsky, winning in a time of 1:16.562, before Henderick toppled Leon Breznik in 1:18.752. It was almost an all-Slovenia/Slovakia final there following victories by Jakub Grigar and Anze Urankar in the men's K1 competition. The two women's K1 semi-finals saw victories for France's Camille Prigent and China's Jiahua Yan over Czech Republic's Amalie Hilgertova and Germany's Selina Jons respectively. The French competitor finished in 1:18.295 almost a second quicker than the time of Yan. 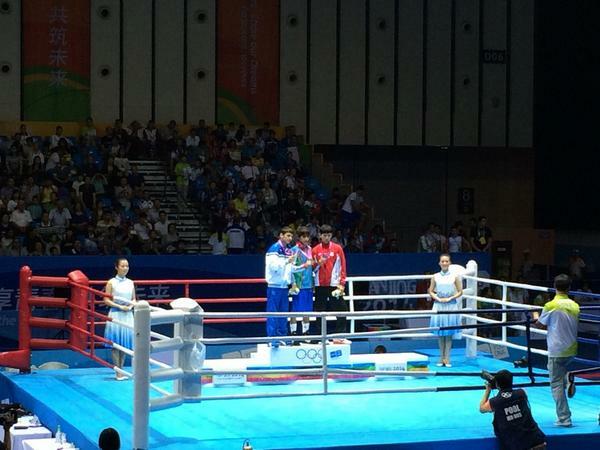 15:38 More gold at the boxing where Ablaikhan Zhussupov of Kazakhstan has sealed top prize in the lightweight contest. 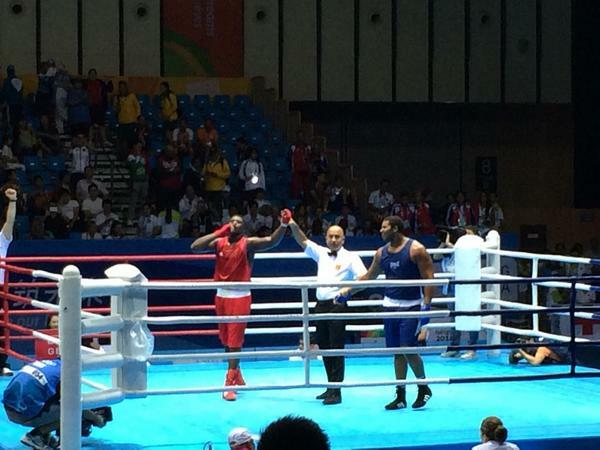 The 17-year-old beats Cuba's Alain Limonta Boudet by split decision to take the victory. Bronze in this contest was won by Hungarian boxer Richard Konnyu. 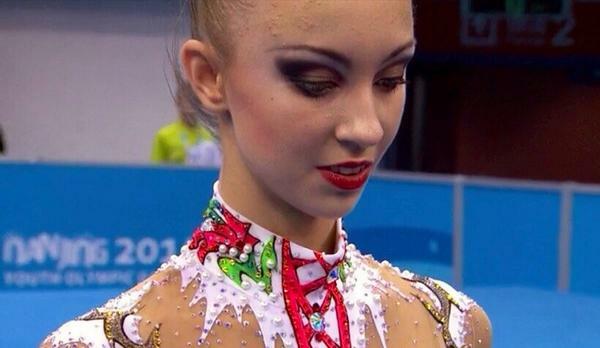 15:30 There are no slip up for Russia's Irina Annenkova as she seals gold in the rhythmic gymnastics all-around final! The 15-year-old finishes second in the ribbon event to cement her position atop the leaderboard and ensure yet more Russian gold at these Games. Her final score of 58.575 is well clear of Maryia Trubach in second as the Belorussian holds off the challenge of America's Laura Zheng in third. 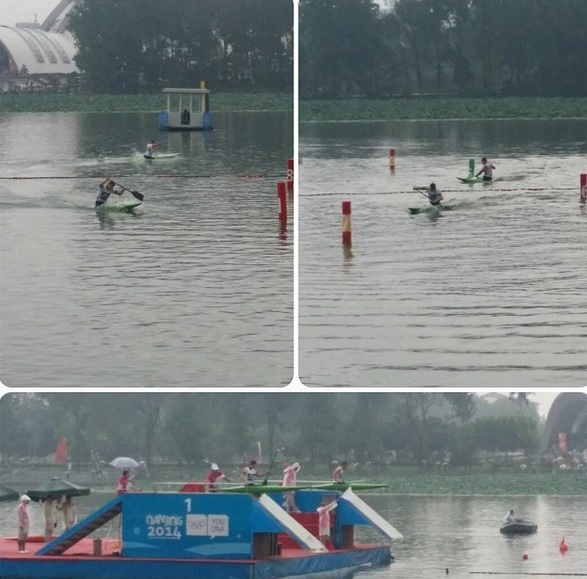 15:23 There have been four winners in events at the Xuanwu Lake Rowing-Canoeing Venue as we get to the business end of the slalom competitions. Austria's Nadine Weratschnig was unbeatable in her women's C1 obstacle slalom semi-final with Germany's Birgit Ohmayer, winning the head to head by almost 12 seconds en route to the final. The Austrian finished the course in 1:23.868. She will now face Czech Republic's Martina Satkova in the final after the Czech athlete won her semi-final over Lucie Prioux in a time of 1:30.020. The men's K1 final will be a battle of Slovenia and Slovakia followed wins for Jakub Grigar and Anze Urankar in their respective semi-finals. Grigar finished his encounter in a time of 1:07.997 to beat China's Song Huang, while Urankar recorded 1:10.877 in his defeat of Great Britain's Paul Sunderland. 15:15 Two new sports have come alive here in Nanjing now with semi-finals in the beach volleyball and canoe-kayak slalom. In the beach volleyball, the Russian pairing of Oleg Stoyanovskiy and Artem Iarzutkin have taken the first set of their semi-final encounter with Finalnd's Santeri Siren and Miro Maattenen. The Russian's looked on top form as they stormed to a 21-11 opener. Can the Finnish hit back now? 15:10 Russia's Irina Annenkova has a comfortable lead in the the all-around rhythmic gymnastics final after recording the top score for the third piece of equipment in a row. Laura Zheng of the United States is second top scorer and closes the gap on Belarus' Maryia Trubach in second. The final rotation is the ribbon, the only round that Annekova did not win in qualifying. It will take a huge mistake to loss the lead now though, it seems. 14:55 Cuba are the next nation to take boxing gold as Javier Ibanez Diaz takes the bantamweight title. The 18-year-old was well above on all the judges cards as he defeats Dushko Mihaylov of Bulgaria. It was another British bronze in this division after Peter McGrail sealed the deal against Salem Tamma of Algeria yesterday. 14:48 Shakur Stevenson wins the second boxing gold of the day! The American beats Ping Lyu by a unanimous points decision to secure the flyweight title. Bronze here was secured by Great Britain's Muhammad Ali. 14:39 Rotation two has come to an end in the gymnastics and it's still Russia's Irina Annenkova on top. The 15-year-old records a high score of 14.800 to extend her lead at the top. 14:26 And the gold goes to Azerbaijan! A unanimous 3-0 decision by the judges and Husynov seals the deal at the International Expo Centre. Subura Murata took bronze in yesterday's action. 14:18 Boxing finals have just joined the day's sporting programme as action slowly begins to build across Nanjing.Uzbekistan's Sulaymon Latipov up against Rufat Huseynov of Azerbaijan are up first. 14:09 As I have stated previously, Russia's Irina Annenkova was the top qualifier for the all-around final here today. She topped the leaderboard in three of the four disciplines, including hoops, and has topped the scoring again in the final. 13:45 We're off and running in the gymnastics and up first it's the hoops! Unlike the Commonwealth Games in Glasgow, where a competitor could win five medals for individual performances via different pieces of equipment, similar to the apparatus finals of the artistic form of the sport, here in Nanjing there is just a individual all-around and group-all around competition. 13:36 Speaking of finals, the 10 competitors set to go head to head in the five wrestling weight categories this evening have now been calculated and announced. In the lightest division, 46kg, Russia's Ismail Gazhiev will battle America's Cade Olivas for the gold medal, while another American, Daton Fix, will lock horns with Mukhambet Kuatbek of Kazakhstan for 54kg gold. Cadet world champion Teymur Mammadov of Azerbaijan will look to reassert his world dominance in the 63kg category where he faces Anthony Montero of Venezuela, with Meki Simonia of Georgia through to the 76kg final along with Japan's Yajuro Yamasaki. The final final, 100kg, sees Azerbaijani wrestler Igbal Hajizada face off against Moldova's Dmitri Ceacusta. 13:23 And finally, after 64 bouts in just over two hours, the wrestling preliminary round has come to an end. Exhausted and aching, the athletes will now take the afternoon off before returning to the mats this evening for classification and finals action. 12:58 Apologies for the long pause in action. On my journey to the Main Media Centre I happened across a rather peculiar sight. 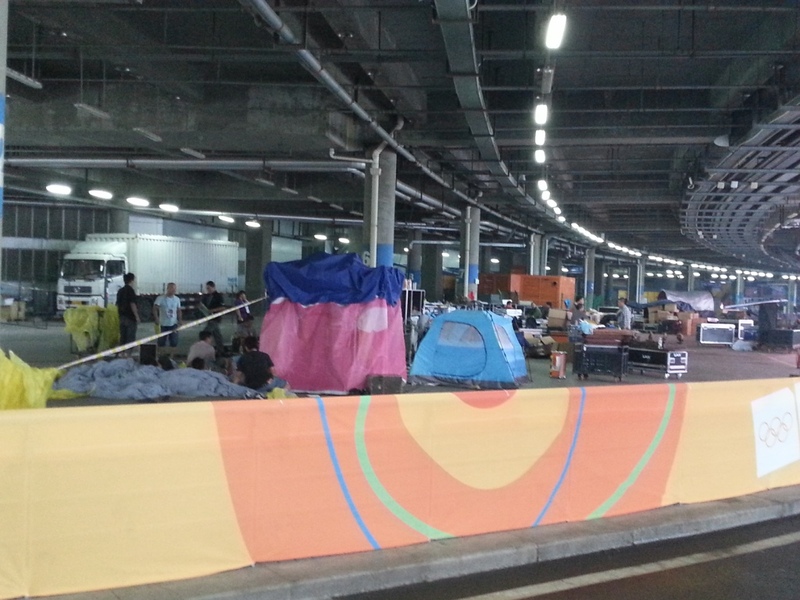 I appears that the staff in charge of preparing tomorrow night's Closing Ceremony have given up on the long travel to and from work and decided to pitch up right outside the entrance to the Stadium. 12:32 That is of course if you're not in the Longjiang Gymnasium where qualification matches are still ongoing at an alarming pace. The Pool fixtures are due to continue until 13:30 before classification and finals get underway from 17:00. 12:28 A busy day of boxing finals will begin at 14:00, as well, with Uzbekistan's Sulaymon Latipov up against Rufat Huseynov of Azerbaijan in the opening bout. It's like a calm before the storm here in Nanjing. 12:12 There's a little over an hour until the first of our gold medal finals gets underway today with action due to begin in the rhythmic gymnastics all-around final. Russia's Irina Annenkova looked strong in qualifying as she finished up on top with a score of 58.950. She'll face fierce competition from America's Laura Zheng, however. 11:38 A look ahead to this evening's beach volleyball action now. Following the women's finals last night, it's the turn of the men tonight as two semi-finals are proceeded by the bronze medal and gold medal finals. The first semi-final will see the Finnish pairing of Santeri Siren and Miro Maattenen take on Russia's Oleg Stoyanovskiy and Artem Iarzutkin. The Russian's have dropped just a single set at the Games so far but should face their toughest test yet against the duo from Finland. The Argentinian duo of Leandro Nicolas Aveiro and Santiago Karima Ulisi had to take the long road to the semi-final after a preliminary pool stage loss to Ukraine saw them battling for a spot in the last 16 with an extra fixture in the round of 24. The boys made it through, though, and will now face Venezuela's Rolando Hernandez and Jose Gregorio Gomez for a place in the final. 11:19 IOC President Thomas Bach gets a lot of attention wherever he may go here in Nanjing. Well imagine if the German fencing champion, from the 1976 Olympic Games in Montreal, were to try his hand a spot of table tennis with say, Swedish legend Jorgen Persson. Well, it turns out he did. 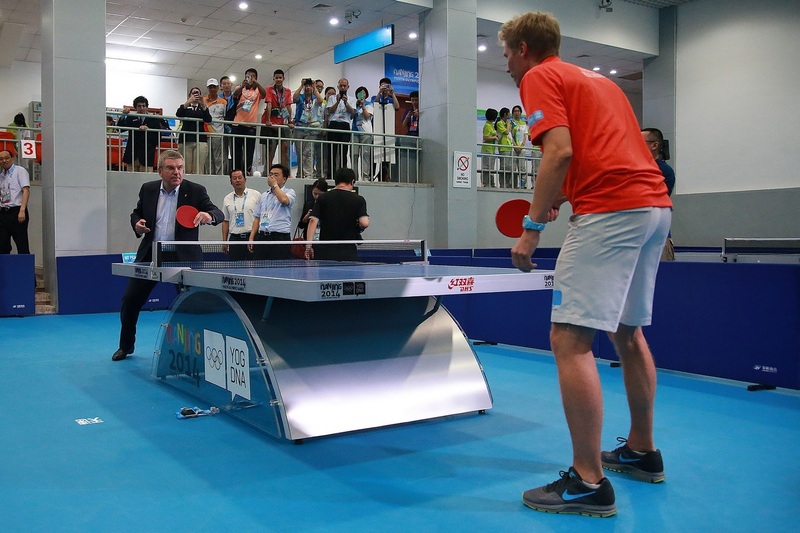 "International Olympic Committee President Thomas Bach got a chance to refine his table tennis skills during his visit to the Table Tennis event at the Nanjing 2014 Youth Olympic Games, held at the Wutaishan Gymnasium. "Bach received a private lesson from 1991 World Champion and seven-times Olympian Jorgen Persson in front of hundreds of onlookers in Nanjing. "After impressing the crowd with his deadly forehand, President Bach met the Youth Olympic Games Champions, Fan Zhendong and Liu Gaoyang to congratulate them on their achievements in the Singles event and wished them the best of luck for the future. "President Bach was so impressed with the level of play from the current senior world number three Fan Zhendong that he promised to personally award him with the gold medal if he becomes the Olympic Champion at Rio 2016. "In addition to interacting with the Youth Olympic Champions, Bach also spent time speaking to bronze medalists Lily Zhang and Hugo Calderano who won the first (Youth) Olympic medals for their respective continents, as well as Brian Afanador and Tamolwan Khetkhuan. "The Table Tennis event was seen by 35,457 spectators and over 100,000 people tuned into the IOC's YouTube channel to watch online, which is the most of any sport at the YOG. "Inspired by the meeting with President Bach, the Chinese Team of Fan/Liu went on to win the Mixed Teams gold medal, beating Japan 2-0 in the finals on Saturday." 11:02 A wrestling update now for you as the results keep coming thick and fast. Teymur Mammadov of Azerbaijan has sealed a win in the 63kg category, along with Anthony Montero of Venezuela. In the 76kg division there have been wins for Meki Simonia of Georgia, Yajuro Yamasaki of Japan, Carlos Arturo Izquierdo Mendez of Colombia and Arshdeep Gurm of Canada, while Vaghinak Matevosyan Armenia has recorded a second victory in the 54kg category. There has also been a first victory for Amirkhan Guvazhokov of Russia in 54kg, Egypt's Abdalla Elgizawee and Azerbaijan's Igbal Hajizada in 100kg while Oscar Eduardo Tigreros Urbano of Colombia has dominated a second bout in the 46kg competition. 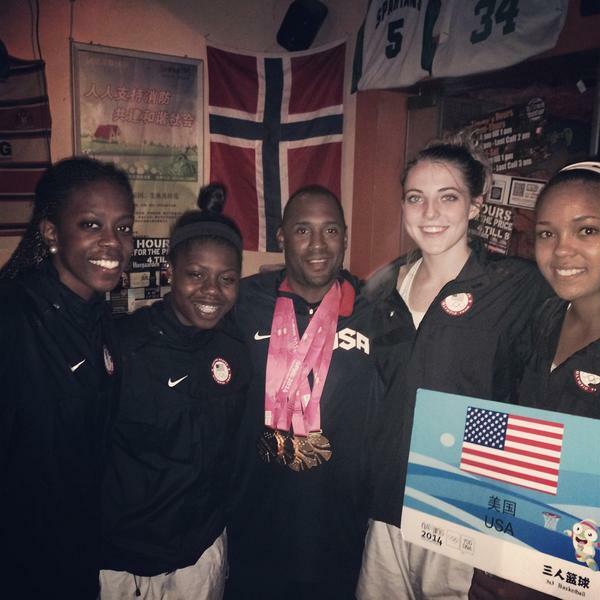 "Ana Patricia Silva and Eduarda Lisboa overcame a four-point deficit in the third and deciding set here Tuesday evening to capture the women's Beach Volleyball gold medal at the Nanjing 2014 Youth Olympics Games over the McNamara twins of Canada. "After losing the first set 21-17 to Megan and Nicole McNamara, Ana Patricia and Eduarda stormed back to win the second set 21-13 over the Canadians. With the Canadian twins controlling the action to start the third set, the McNamaras grabbed an 8-4 lead. A 5-1 run by the Brazilians tied the set at 9-all as the two teams competed until the end with Ana Patricia and Eduarda prevailing 16-14 in the 42-minute match. "Both teams entered the gold medal match after winning afternoon semi-final affairs with the Canadians defeating Lisa Arnholdt and Sarah Schneider of Germany 2-0 (21-18 and 21-18) in 33 minutes before Ana Patricia and Eduarda downed Nadezda Makroguzova and Daria Rudykh of Russia 2-0 (21-18 and 21-19) in 38 minutes. 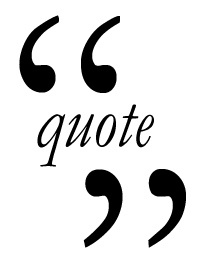 "'We are still very happy,' said Megan McNamara, who is 19 minutes older than her sister. 'They are a very good team. Our goal was to win a medal, and it's amazing we were able to do that. We are happy to be here."' Sister Nicole echoed the same and said 'it was an awesome experience to be here, and the medal makes it even better. Our hard work paid off.'" 10:31 Floods of wrestling results streaming through now..
Russia's Ismail Gadzhiev won his 46kg contests with his win followed swiftly after by Prakash Vasant Kolekar of India, Mohamed Hegab of Egypt and Cade Olivas of Unites States. In the 54kg category we've also seen wins for Vaghinak Matevosyan of Armenia, Mukhambet Kuatbek of Kazakhstan, Daton Fix of Unites States and Ebrahim Abdullah Ali Al-Shebami of Yemen. We're no underway in the 63kg contest with wins for Elbert Lukas Steyn of South Africa and Alexander Moore of Canada so far. Still plenty of wrestling to come this morning before finals begin this evening from 17:00. 10:06 And we're underway in the wrestling first up is Oscar Eduardo Tigreros Urbano of Colombia against Russia's Ismail Gadzhiev in the 46kg category. 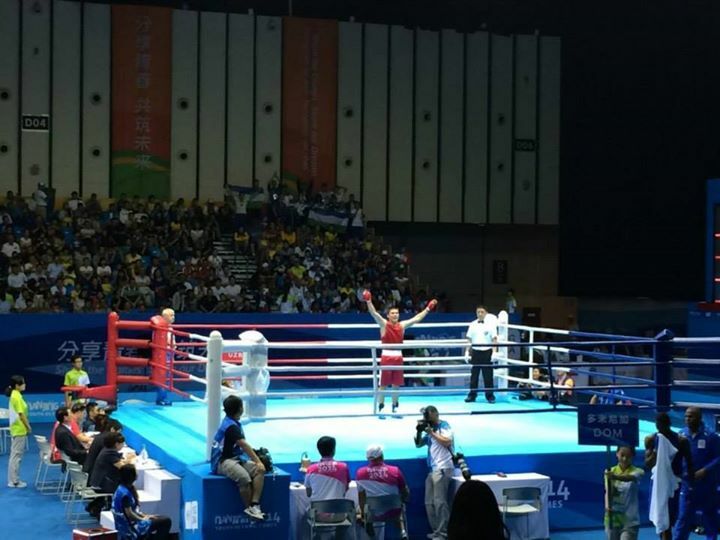 09:59 After making its debut at the Commonwealth Games in Glasgow just last month, women's boxing made a historic entrance into the Youth Olympic Games here in Nanjing. 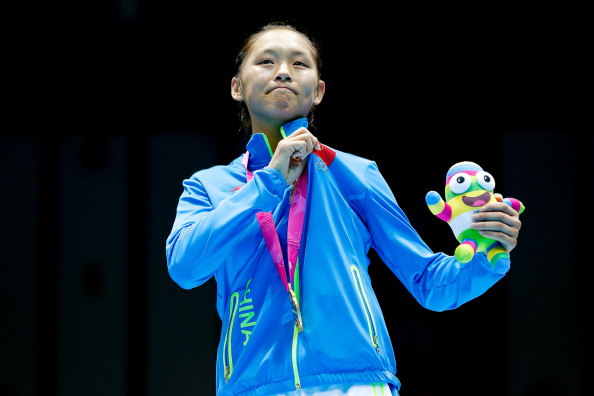 Fittingly, it was China's junior world champion Chang Yuan who celebrated the winning of the first gold medal in the sport at these Games after defeating fellow junior world champion Irma Testa of Italy in the flyweight division. An interesting fact about last night's action is that no nation won more than one medal. with the nine medals on offer across the three categories coming from nine different nations, with three confederations, the Asian, the American and the European each claiming one gold apiece. 09:50 We're just 10 minutes away from out first taste of sporting action for the day. Unusually, there have been no early morning encounters to speak of following the conclusion of many early risers, and the act that many others just have evening finals to speak of today. 09:37 If you want to relive everything that happened on the penultimate day of action yesterday, then why not catch up on our live blog from the day. With news, views and medals from across the day's play, you'd be silly not to... Just click here to jump right in. They beat The Netherlands, a team that had beaten them in a practice match before the Games, by 19 points to 10 to land gold around their much deserving necks. 09:20 The final gold medal of yesterday's action came at the Wutaishan Stadium where hosts China dominated Venezuela in the women's football final. China had not conceded a goal throughout the proceeding fixtures (disregarding two goals for Slovakia in their semi-final penalty shootout) and their goal was barely threatened again in the final as they strolled to a 5-0 thrashing of their South American opponents. Speaking after the game, Chinese goalkeeper Xu Huan, who may have been slightly bored throughout the match, reflected on the team's performance. "We were working really hard towards that goal and prepared for a long time with blood, tears and sweat.We didn't think we would win by that much because we thought Venezuela would be very strong, but they weren't." "We are really happy with our performance and so proud to win that gold." 09:11 It's a big night for men's boxing with a whopping 10 gold medals up for grabs across all men's weight categories. These are joined by five gold medals in men's freestyle wrestling, four in canoe slalom, two in rhythmic gymnastics and one each for hockey, diving, football and beach volleyball. 09:05 After 10 days of adrenaline-fuelled action, we're finally down to the last day of sport here at the Summer Youth Olympic Games. Sad, I know. But don't worry, we still have 25 gold medals to be won across eight sports, giving the perfect end to what has been a superb couple of weeks of youthful competition. 09:00 Hello and welcome back to the insidethegames live blog for the final day of sporting action here in Nanjing.